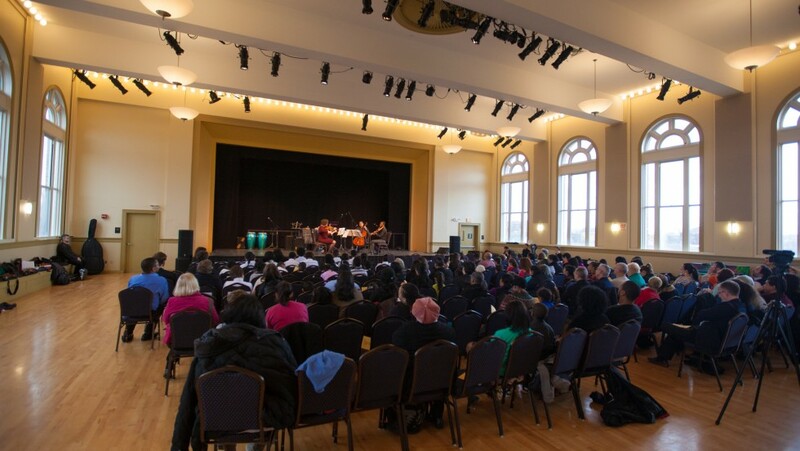 Neighborhood Arts’ first performance at Hibernian Hall took place on April 5, 2014. The Roxbury Stringfest is held here each December, plus additional community events typically in March. Artists such as Jorge Arce, Boston Public Quartet, Castle of Our Skins, Guy Mendilow Ensemble, Masary Studios with saxophonist Stan Strickland, Quartet of Happiness, Sol y Canto and Soul Yatra Trio have appeared at Hibernian Hall through Neighborhood Arts. Built in 1913 and fully renovated in 2005, Hibernian Hall hosts a wide variety of events and is a major arts and culture hub in Dudley Square. The facility is wheelchair accessible, a multi-functional space with moveable seating and platform staging which can be configured to a variety of performance needs. Hibernian Hall’s performance space is located on the third floor and can be accessed via stairs or a wheelchair-accessible elevator. MBTA buses 1, 15, 23, 28 and 45 and the Orange line to Ruggles Station connect to Dudley Station. There is both on street free parking and municipal and paid parking lots in Dudley Square.